an amazing book about the sociology and symbolism of fashion i found over the holidays in jacksonville, florida, at my favorite secondhand bookshop of all time, chamblin’s bookmine. 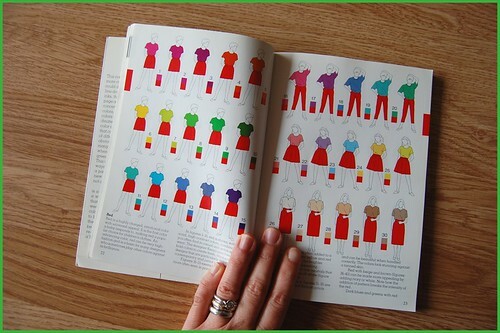 my copy is from 1981. lurie looks at most colors and patterns, too, amongst many other subjects related to clothing and it’s meanings…it is a fascinating tome. i highly recommend it. for a long time i have been yearning to take books from my collection, and show you and share with you their interesting insides. not all of them are “fashion” related, but are inspiring all the same. i can’t keep all this good stuff to myself! i want to share it! when i can find the time (i have so little of it these days, what gives? *sigh*) maybe i will share some peeks into my books with you. cool? 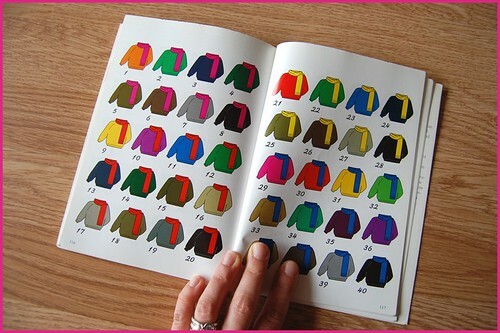 perhaps they will inspire you somehow, even if it’s for something as simple as a clever color combination in the clothes you deign to wear or perhaps a personal touch you can maybe add to something you’re making (clothes or otherwise)? or maybe they can just fun to look at!? i think so! 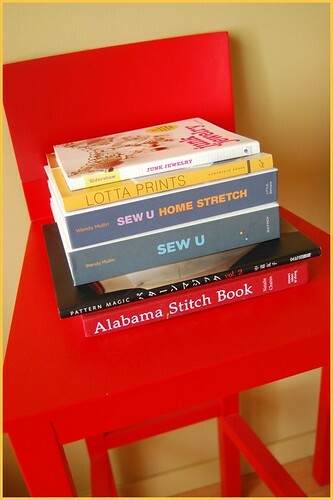 most of the books in my library are craft, art, or fashion related. i am a book lover, a book addict. i especially love old books, and seek them out wherever i can: thrift stores, antique fairs, amazon, ebay, you name it. i love the old, sometimes forgotten tomes and styles of the past; old books are a lovely window into past styles, fads, and norms. so, so fascinating, no? 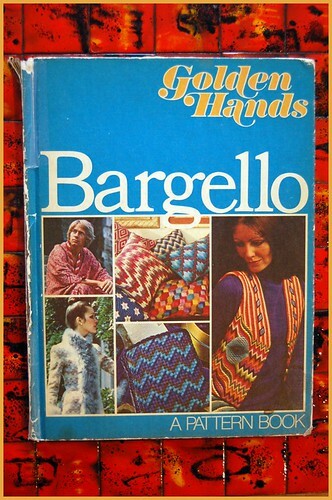 here’s a book i found at a thrift store this past week for one dollar: golden hands bargello. looks like it’s from the 70s. for those who don’t know, bargello is a style of needlepoint embroidery, usually employing wool yarn, which is stitched to a canvas backing. you often see it adorning old pillows, ottomans, and the like, but it can and has been used to adorn clothing and accessories. 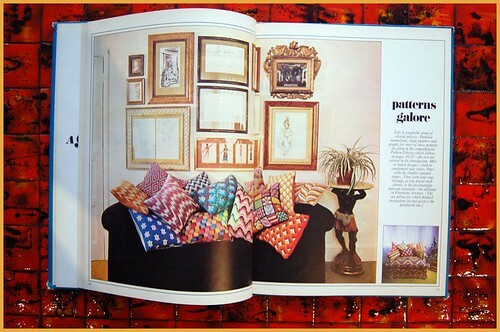 decorator/ceramacist jonathan adler has famously used bargello on some of his pillow designs. 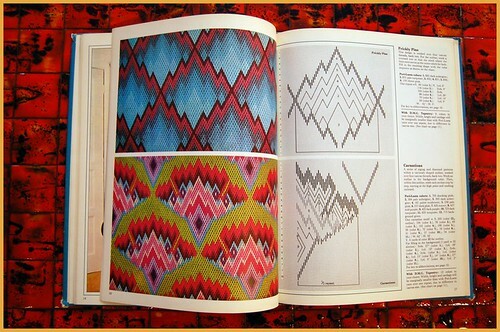 i love bargello for a bunch of reasons: it’s graphic, it’s textural, and there’s a lot of potential for colorplay. 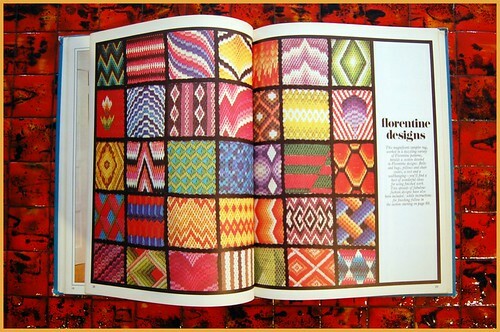 i love bargello best when it’s especially colorful…the more riotous the colors, the more i like it, as is my way! 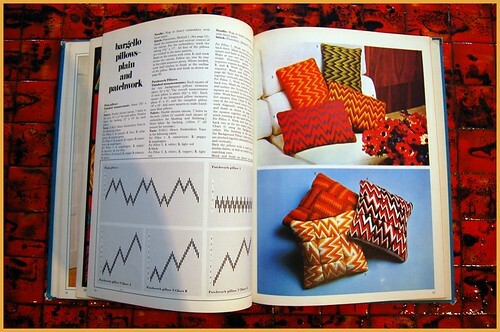 i have a small collection of bargello pillows, i would like to add to it over time, if time and money will allow! 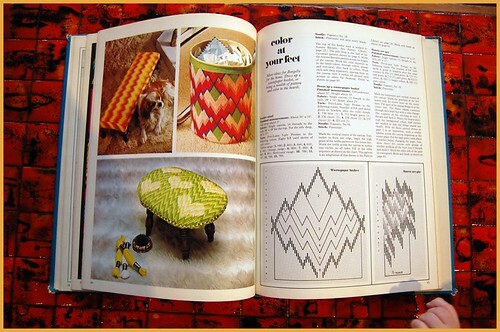 this one is especially timely for me…i found a tiny little ottoman at a thrift this week that i want to restore/restyle/referb, and seeing this page (and the whole book, really!) totally makes me want to stitch up a little bargello topper for it! 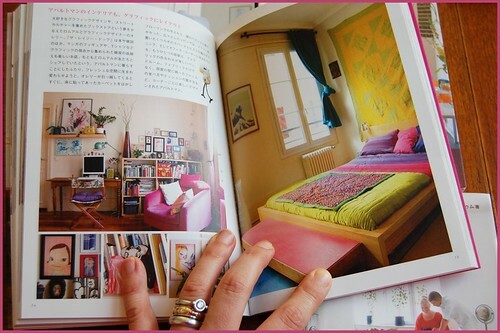 Written by triciaroyal 3 Comments Posted in book peeks, crafty cool., home(sweet)home, this inspires me! 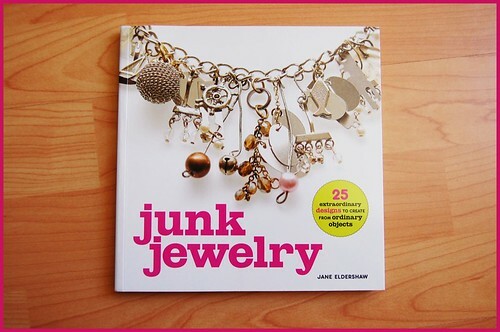 junk jewelry, in the simplest terms, is about elevating everyday or ordinary objects to the level of art, fashioning artistic jewelry, and then daring to wear said jewelry in an inspiring way on one’s own body. 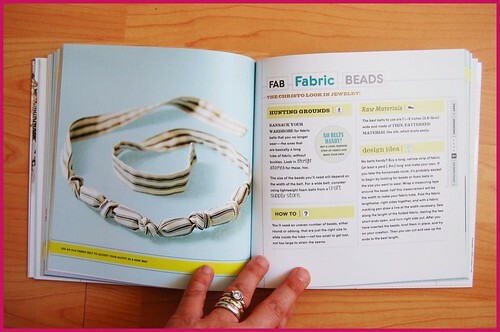 not everyone will take a shine to making or wearing junk or trash-to-treasure jewels…but this book celebrates and inspires those who do. 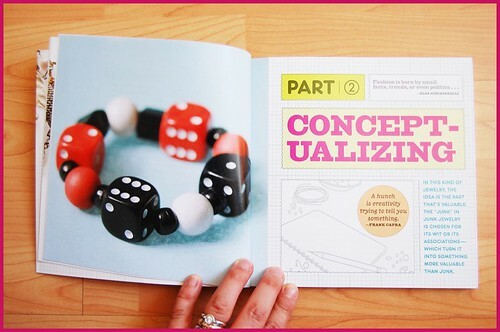 it’s a positively sound little jewelry making book that differs from the typical jewelry-making book in a number of areas…particularly in its overall philosophy, approach, and execution…as i’ll detail some below. from the outset of her book, jane aims to educate, not just inspire. 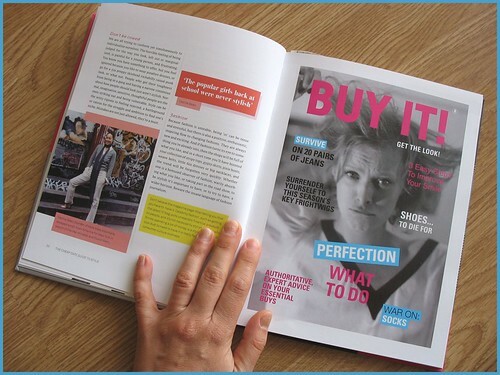 it’s not merely a book with projects and pandering explanations…it’s jam-packed with tons of food-for-thought and information from the get-go that go beyond the basics…it’s really a course on art, art-making, and style. jane also highlights a litany of iconic fashion and accessory designers of past and present who used junk to great effect when creating their jewels, including elsa schiaparelli, karl lagerfeld, moschino, coco chanel, paul smith…and many more. part two is all about the conceptualizing process. jane shows the reader how to think like an artist, and illustrates a myriad of artistic techniques, all to get the reader/budding designer’s mind spinning. some of jane’s suggested artistic techniques that i really adore and find really inspiring include “elevating the mundane to art status by isolating it” and “for unity, group by color shape or texture”. 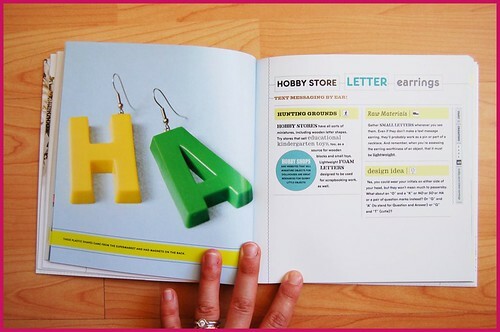 the third part of the book is the creating section…it’s the part with all the projects. most of the projects jane has in the book are simple and spare in appearance, a tactic i think is really a great move, design-wise. 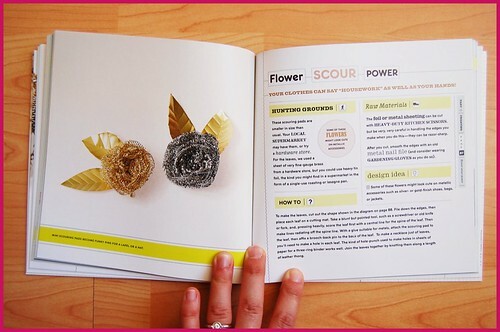 showing off simple projects makes for easy completion, which is of course gratifying for beginners and appealing to minimalists, but i feel like keeping the projects and photography of said projects simple also looks visually clean, and gives those who desire the moremoremore a clear, inspirational jumping off-point for their own, more chaotic, or daring designs. said folks can look at a simple project or nicely shot photo and easily see where they’d care to add this or that, i.e., how they’d change the project to add their own idiosyncratic flair. 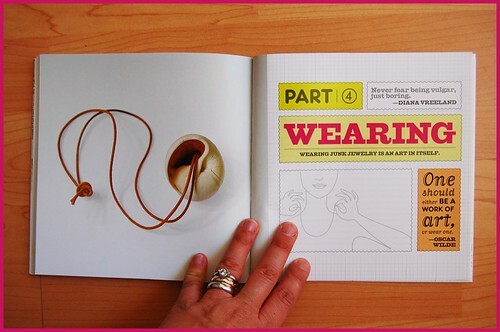 the last bit of the book focuses on the wearing of junk jewelry…it’s a little primer on the art of wearing your quirky baubles (handmade by you, or otherwise) with panache and attitude. 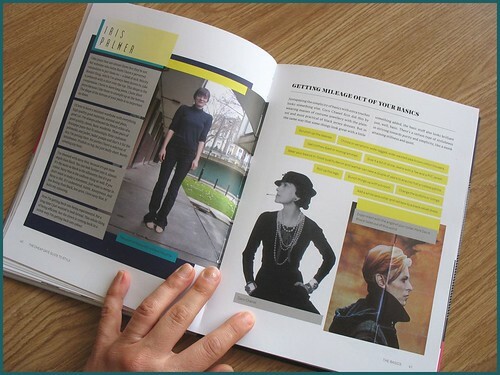 here, jane touches on sound accessory and clothing styling principles that range from donning your jewels with an eye and mind for “suitability”, focusing on a “focal point”, or dressing around a “theme” (and several more, natch). said suggestions are so strong, they move beyond the styling of junk jewelry…they find relevance and context in the styling of oneself in general. i feel compelled to mention a nice bonus feature of junk jewelry that metaphorically speaks volumes about the book as a whole: from front to back/cover to cover, the book is peppered with great quotes, hand-selected by jane, that touch on art and art-making, as well as fashion, implying there is a strong thread between the two, a notion i wholeheartedly support and share. this implied relationship between art and fashion as seen in her book is, i’d guess, a reflection of what jane’s ethos just might be…that making (junk) jewelry, and the results of said making, are not just fashion, they can also be art. 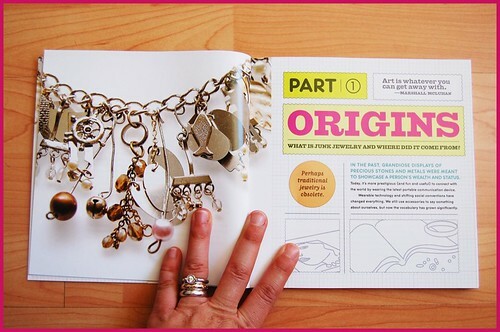 in this book, she’s not just showing you how to make jewelry or follow instructions on a project…she’s giving you the tools to be artistic, *and* stylish, too. all in all, very, VERY cool. Written by triciaroyal 10 Comments Posted in amazing art, book peeks, crafty cool., fashion musing, this inspires me! my creative inspiration and creative thought expands far beyond that which is wearable, sometimes (no, often!) venturing into the product design, and interior design realms. fashion is not, by any means, the be-all-end-all. i want the space that i live in to represent me and feel like my aesthetic just as much as the clothes i choose to put on my back. my creative drive is by no means limited to my person or the human form…it seeps out everywhere and into everything. everything is up for grabs for inspiration and as a target for creative energy. 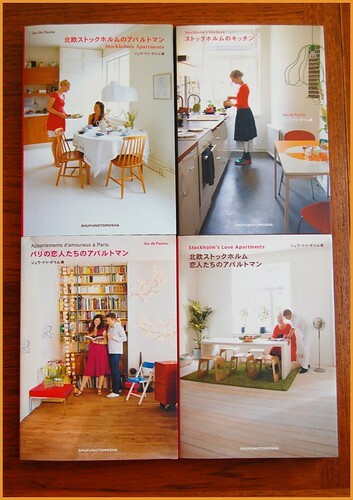 i often find myself looking at as many or more design and interior design blogs and books than i do fashion. because really, eye candy and inspiration is everywhere, and really, the boundaries between the worlds of design are really, truly permeable. so on that note, i’ve been starting a little collection of jeu de paumes books. 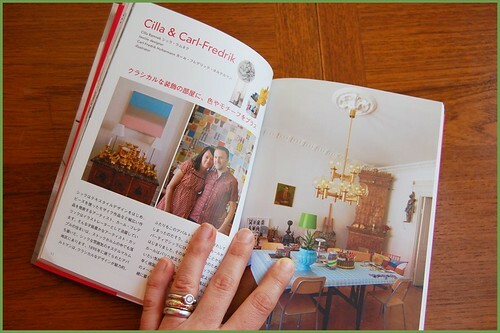 jeu de paumes is a japanese company that publishes little books that peep into the abodes of creatives living in major european cities like paris, london, and stockholm. the books are full of color and whimsy, and are brimming with creative inspiration, especially for those who like things quirky. above all, though, the interiors shown feel very accessible: they are full of flea market and thrifted finds, inspirational uses of IKEA wares, and making do with what one has…and most of the spaces shown aren’t grandiose or ridiculously outsized, in fact, many of the apartments are quite small. great inspiration, then, for those of us elsewhere who are also living in diminutive spaces (most city dwellers the world over, i’d venture!). i adore the bright bed linens shown here, and placement of the quilt above the bed. 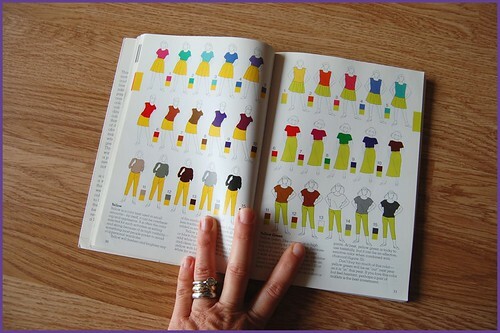 because i favor such bright colors (all of them at once sometimes! ), i keep finding myself attracted to stark white walls and solid, simple hardwood floors: both make a fine blank slate for an abundance of bright hues. 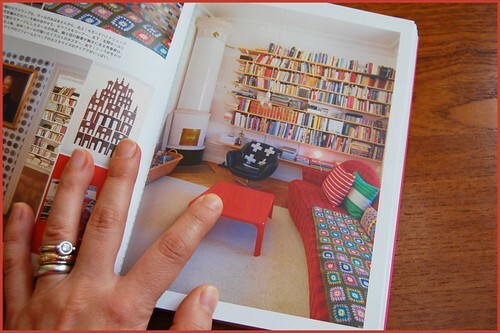 these shots are from the apartment of cilla ramnek (and her partner), a swedish textile designer i’ve mentioned here before. she’s also the author of knitprovisation, a book i reviewed on bits and bobbins back in february of last year. 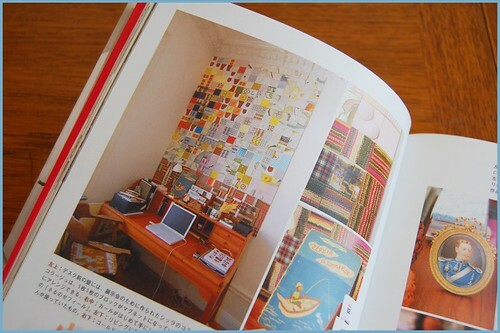 the collage above her computer desk is so awesome…i’m in love! note the granny square blanket and needlepoint pillows. in an alternate universe, this could be MY apartment. seriously. i love how this couple (who’s expecting) just has a simple crib and a few choice toys for their baby-to-be, and it’s in their bedroom. something similar will likely be happening in our household. 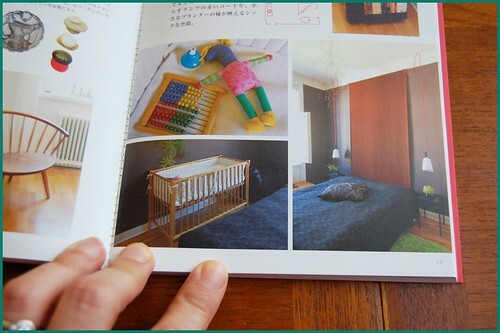 a few choice, colorful, things makes more sense for a newborn (and for our space) to me anyway. i like the minimalism of it all. i found my copies of the paumes books at the kinokuniya here in san francisco (i’d venture to guess the location in NYC has them as well), but they can apparently be ordered online as well, from the paumes website. bonus: there’s also a jeu de paume inspired community on flickr! Written by triciaroyal 9 Comments Posted in book peeks, home(sweet)home, this inspires me! it’s been a while, but here comes another installment of …reviewed by me, for you! more to come in the coming days and weeks. i’ve got a backlog! not sure how i came across this new tome, i pretty sure i stumbled across it on amazon.com. good old amazon most likely recommended it to me based upon my other purchases (isn’t that nice? i’m always lurking around over there…i’m OBSESSED with books). 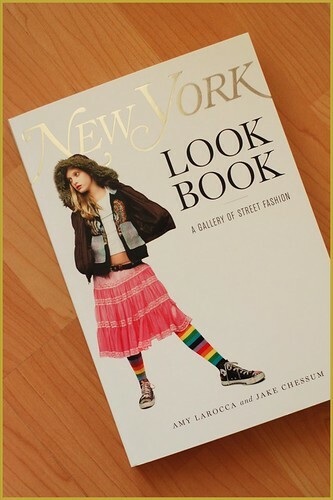 tis an offshoot of new york magazine‘s look book street fashion feature, the archives of which can also be found right here. i’ve been checking in with said archives regularly the past couple of years, and i was delighted to see that they had been compiled into an actual, factual book. the internet is more than fine and dandy, but there’s something temporary, ethereal, and changeable about it, just as it’s nature, whereas a book is a tangible record. me likey. -the white backgrounds give the portraits a clean feel, undistracted by cluttered backgrounds (i like these sorts of street portraits both ways, actually (sometimes the background gives a mood, or sets the scene or says a lot about the individual)), but here it works, and it sets the new york magazine look book photos apart from the pack as a result. 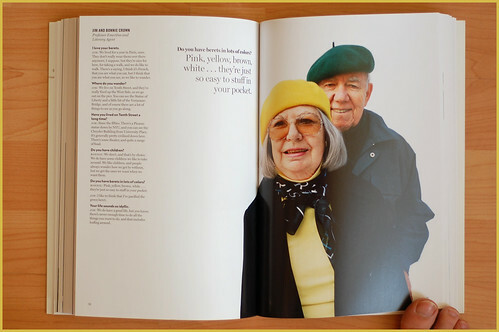 one could argue that the white backgrounds let the clothes (and the people wearing them) do the talking. 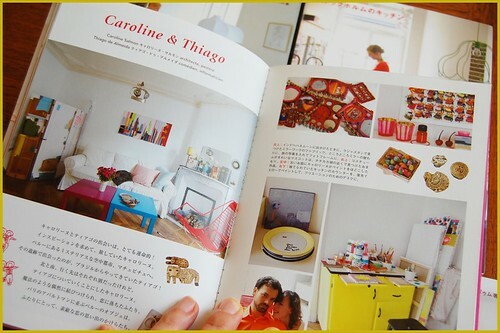 -the book has short interviews with the individuals, which give a deeper look into their style and their life on the whole. why they wear what they wear, what their clothes say about who they are. i’ve said it about a million times before: clothing is more than just shaped pieces of fabric we use to cover our bodies…it is a form of symbolism which defines who we are and how we want to be perceived by the world at large. the words add something to the photographs…they make the person more real, and their portrait that much more rich. 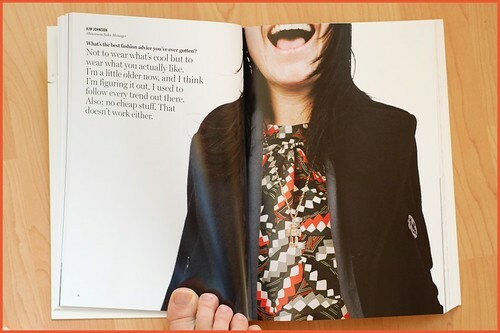 -the people pictured in the book are diverse: it’s not all ridiculously rich, young, skinny people clothed in the latest designer threads or all coked-up hipsters. it’s young, old, rich, poor, all colors, all styles, all everything. again, a reflection of NYC as a whole. LOVE it. -the back has a shopping guide, broken up into sections by NYC neighborhood. nice! 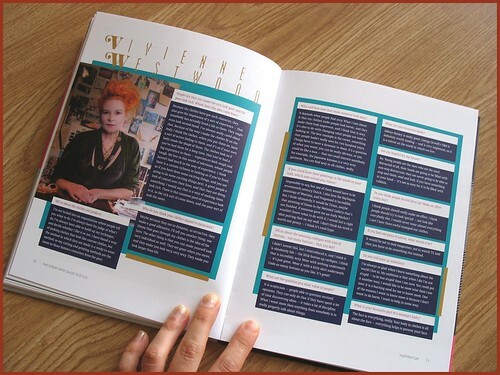 here’s a small peek at some of the pages and the terrific portraits. check out the quote on the middle one. Written by triciaroyal 6 Comments Posted in amazing art, book peeks, street fashion, this inspires me! i love libraries! whenever i have time, i love to go to the local library and peruse the stacks. my favorite library sections to cruise? the craft section (which contains the knitting, crochet, sewing, and fiber art books) and the fashion section (including tomes on style, fashion history, and the like), and the art, photography, science and history sections too. i especially love the older books (pre-1990s) because they often give a fun peek into the cultural and aesthetic norms of the somewhat-recent and sometimes not so recent past. i look at my local library (or libraries as the case my be) as a terrific an extension of my own personal book collection, there for the borrowing and sharing. i’m really bad too: i always end up checking out huge stacks of books, intending to gluttonously OD on knowledge, and i struggle to get them home as a result! it’s quite a funny sight, i’m sure, with me nearly dragging my stack along behind me and cursing myself because of the tremendous weight pulling down on my shoulders and back. i think that we’re so lucky to have libraries, really! they are undeniably a rich resource at our fingertips, ready to enrich our minds for *nothing*. thus proving the adage: some of the best things in life are free. 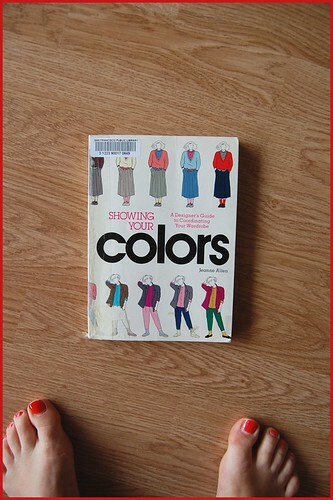 on my last library visit, i found this great 80s book, showing your colors: a designers guide to coordinating your wardrobe by jeanne allen, in the style section. as one might guess, it’s all about coordinating the colors in one’s wardrobe. it talks about the mixing of colors, the feeling said colors give off alone or when used in conjunction with other colors. it’s really a fun way to see at a glance how colors sit with one another on the body in different proportions, and can help one ferret out interesting, unexpected pairings that might be fun to take for a stylistic spin. suffice it to say: awesomeness overload for a color junkie like myself! worth a flick if you can find it at your local library. Written by triciaroyal 4 Comments Posted in book peeks, fashion musing, this inspires me! here comes another installment of …reviewed by me, for you, as yet another book has been added to my (severely clogged and nearly sagging) bookshelves! 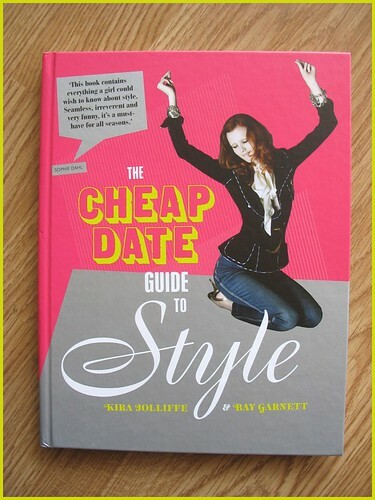 the cheap date guide to style by kira jolliffe and bay garnett: i first read about this book in a blog entry written some time ago by miss susie bubble of style bubble. After I read through the whole thing in about an hour, I concluded that for me, the book would be better named ‘Style Affirmation.’ The book, far from adopting a ‘Do this, don’t do that’ methodology is about encouraging a unique personal style, cultivating eccentricities and really putting your own stamp on things. in other words, this ain’t your typical style guide…it’s a completely different animal, one that celebrates realness, quirkiness, risk-taking, and being offbeat, if that’s your way. or really, whatever your way is, if it’s really *you*. it’s probably not for those people who need a lot of help trying to figure out who they are, but rather, a little mutual-admiration for those who already embrace the beat of their own style drummer and create their own look or looks. the book has an imperfect, scrapbook-like, teen-magazine-in-the-80s-sort aesthetic, and is filled with loads of photographs that have a flash-lit, harsh, “i took them with my little old point-and-shoot film camera” style, i.e. the whole affair is not a high-fashion glamorously glossy and perfec production, and is thus approachable. 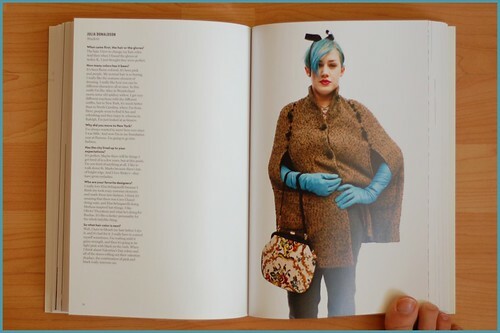 it’s more grassroots, like an anti-fashion fashion magazine in the form of a book. inexplicably, in it’s realness, it takes on a magical chicness and honest glamour. Written by triciaroyal 6 Comments Posted in book peeks, fashion musing, this inspires me!